10:10 just got a notice of a hex pattern. See tutorial on Hex Wheels, and Hex Wheels Today, linked on right side of ListOfCharts page. This one formed by price, Venus, Jupiter, Neptune, and Pluto. 9:52 on a 24 hour chart we are in a move 4 of 7 in a down Chaos Clamshell. Move 4 can be choppy and drawn out. 9:44 Dow, S&P, and most of my monitored stocks are down. 9:38 on my spliced 8 hour two day charts, this is a gap down. Frequently "Gap down, sell a high near 11:00" works. 9:25 things can change on the open of the normal session when overnight stock orders get executed. A lot of orders get executed in "dark pools" overnight. To learn about this, read the book "Flash Boys." 9:11 the MoonTides have 4 turns in first 2 hours of normal session. Usually means choppy. the vertical magenta line. 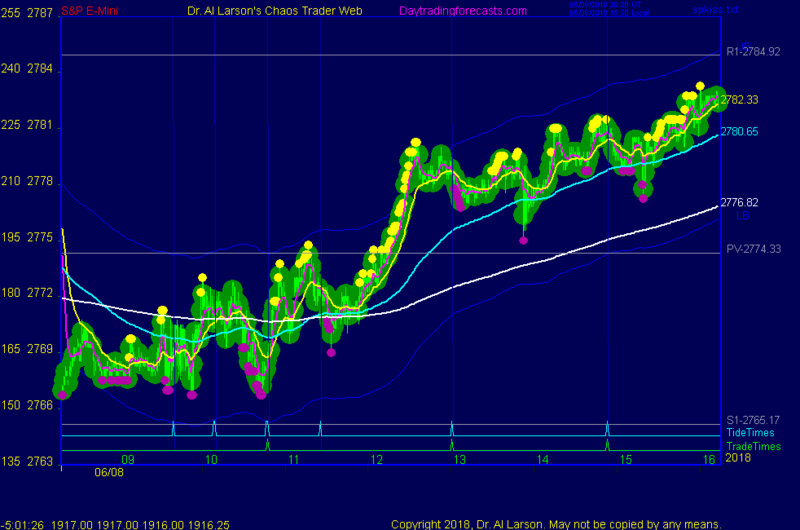 The rebound has gone to the midpoint between these sets of green flux lines. This force, counter force, balance action is the physical reason behind the common 50% retrace pattyern. and is now in an up swing. It may just trade between yesterday's high and this morning's low. 6/8/2018 12:32:01 PM MT TG****:: glad to hear it Al. Have a great weekend. 6/8/2018 12:16:45 PM MT TG****:: A complicated move 6 I didn't want to deal with. 6/8/2018 11:53:28 AM MT PSS:: I am considering the Moon tides methodology, however my only concern is that if the service stops down the road for any reason, will I still be able to use the methodology on my own? 6/8/2018 11:34:51 AM MT PSS:: Dr. AL, By the sounds of it, you have tried timing trades using only aspects and have not found it consistent? 6/8/2018 11:03:42 AM MT srj****:: Thanks PSS - will try it out. 6/8/2018 10:49:09 AM MT srj****:: Hi GM Dr, AL, all. 6/8/2018 10:39:40 AM MT TG****:: Could have been a big 7, too. I don't know. Took 10 when the opportunity presented itself. I got 9 out of the late up move yesterday and was strongly considering holding overnight for more. Glad I scrapped that idea. That would have been brutal. 6/8/2018 10:29:13 AM MT TG****:: Looks like a decent up Chaos clam shell is underway. Seems to be in move 5 intraday (8:15 - 16:15 chart time only). 6/8/2018 10:04:10 AM MT TG****:: I took a stab at a buy and bought the latest retest of today's outcry open with a pretty tight stop. I find that in a choppy day the flash boys test that price level a lot. 6/8/2018 10:01:11 AM MT TG****:: I missed the fact that the roll came early this month. Didn't realize it until this morning. I usually leave my charts set on Esignal's continuous contract and they do their roll for that ticker symbol on the Friday evening open. I wasn't watching the overnight action. 6/8/2018 9:51:17 AM MT TG****:: A lot of close early tide times plus the contract rolling seems to have added a lot of confusion early on. 6/8/2018 9:48:51 AM MT TG****:: Al, I like to trade mainly based on the fractal grid but on Fridays I like adding the tide times into the mix and reading your comments. Unfortunately I've never been able to do a good job merging the chaos tools with the tide times on a full time basis. 6/8/2018 9:22:05 AM MT TG****:: Good Morning everyone, good luck today.